Onlookers await word on Jean Mackenle Verpre in Port-au-Prince, Haiti. Port-au-Prince, Haiti (CNN) -- Sometimes, the angels win. Former student Jean Mackenle Verpre was visiting a first-floor classroom at the Holy Trinity School and Craft Center when Tuesday's devastating 7.0-magnitude earthquake sent the building crashing down. A white Toyota police SUV, license plate 4-08, very well may have saved his life. 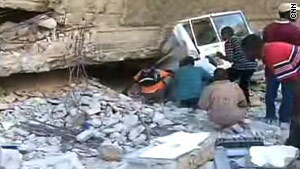 The vehicle caught the brunt of the collapsed five-story building. It also helped trap Verpre. He lay in the darkness before someone heard his pleas Wednesday afternoon, and his father, his brother and a friend started to dig him out. Jagged little chunk of concrete by jagged little chunk of concrete. Their only tools were a chisel and an acetylene torch. Above them, huge parts of the building hung precariously, looking as if they could come crashing down with no more than a stiff breeze. Inside the 5-foot-long cave the men dug to reach Verpre, the rescuers had to be careful not to excavate so much that they would cause the building to crash down upon them. Verpre lay on his right side, and by Thursday morning, the men had managed to free him enough that he could move his left leg. He also could talk, with enough English to speak with CNN national correspondent Susan Candiotti. He remained jammed, and his father and brother remained determined. Lying on their stomachs or crouched in the small enclosure, they cut away at the car with the torch. They brought in rocks and pieces of debris to prop up the building, filling the space around the trapped former student. By Thursday afternoon, all that remained snagged was an arm. The rescuers used the torch to carve away at the car metal that held Verpre captive. The torch heated the metal, and Verpre screamed in pain. Horrible, piercing screams. The men took in small bottles of water dipped from a bucket to cool the metal. Silence and then another scream. This happened four or five times, until word came out that he was almost free. The crowd of about 100 onlookers pressed closer in anticipation. The work continued slowly, and then a small chunk of concrete fell from the outside wall, and the crowd scampered back to the street. The same thing happened again a short while later as momentarily panicked people pushed and shoved to scramble to safety a few feet away. Finally, two legs emerged, held aloft by the rescuers. Then Verpre's whole body emerged, born again into the world at 3:10 p.m. The crowd surged in, many hands now lifting the injured man as he was carried rapidly to a red Dodge Ram 2500 pickup parked around the corner. Shouting broke out as excited people clambered onto the vehicle. One woman held her hands up to the sky. Verpre's body disappeared into the truck bed, hidden by the more than 20 people who climbed in around him. The truck sped off, four or five young men standing on the bumper and hanging onto the tailgate. Work was not finished at the collapsed building, though. One rescue ended, and another one began. A woman's voice could be heard inside. A man crawled into the tunnel, calling out a name. Another man climbed onto the second-floor rubble, calling out the same name. People in the crowd yelled at him to get down, lest he cause the building to collapse further. He climbed down, and another man broke off the handle from a long homemade broom and carried it to the hole, apparently to see whether it could reach the woman. The afternoon heat was dissipating, and it would be dark in a few hours. But the work will continue until no more voices are heard.